The owner of a 19th century stone farmhouse on Huntmar Drive says he doesn’t know what else he can do to stop vandalism on his property. Although just a few hundred meters from a police station, the house is set back from the road, hidden behind a thick wall of trees and bush. It’s on property that Karam intends to develop into a series of townhomes, low-rise apartments and commercial/office buildings. The stone house is included in the development plans, and would be re-purposed for commercial or office use. Karam says since the home went on the city’s heritage register, he’s had to deal repeatedly with trespassers and vandals. 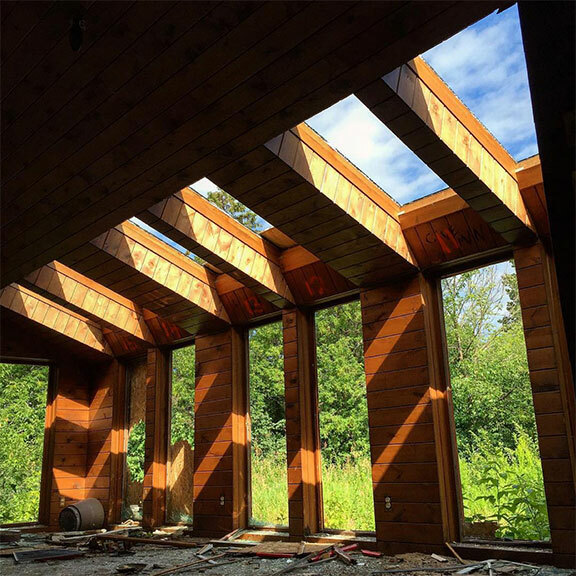 At some point this summer, someone broke through the boarded up windows and caused extensive damage inside, as well as smashing some remaining exterior windows and spraypainting the walls. Vandals smashed windows, spraypainted walls, and damaged woodwork at a heritage home at 173 Huntmar. This photo and the one at the top of this article were shared with us by a concerned citizen. 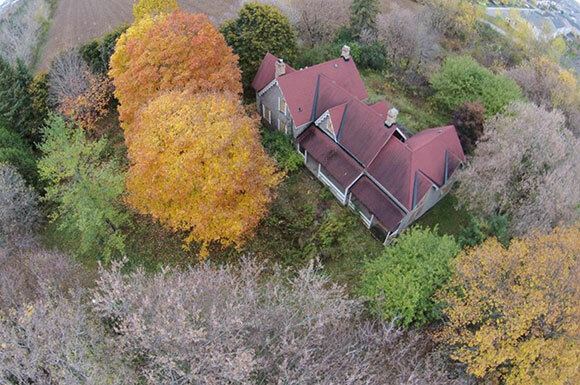 Fall 2014 aerial photo of the stone house at 173 Huntmar by @TwitchxB. 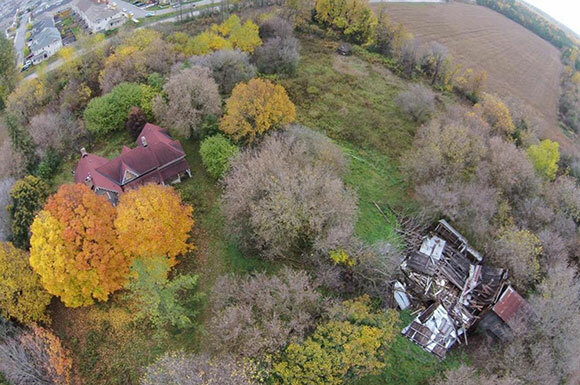 Fall 2014 aerial photo of the property @TwitchxB. 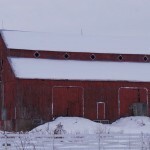 The century barn was destroyed in 2013. The Fairwinds community is visible in the upper-left of the photo. Ottawa Police Constable Lori Fahey says she became aware of the damage on August 4, and filed a break and enter report. She says she believes that most of the damage had occurred days or weeks earlier. “The owner of the property has made efforts to secure the premise and prevent further damage. He has also placed signage on the property clearly identifying it as ‘Private Property’ and prohibiting trespass,” says Fahey. Fahey said that so far the measures taken appear to have helped decrease the vandalism. 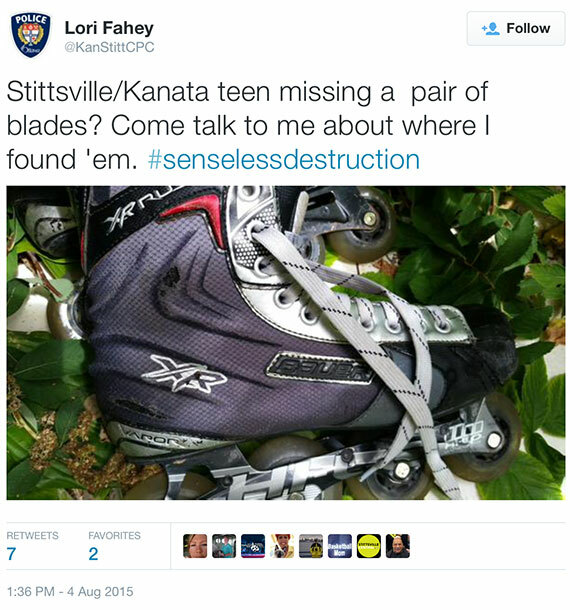 She recently shared a photo of a rollerblade that may be linked to one of the instances of vandalism. Leslie Maitland is the past president of Heritage Ottawa. She says vandalism of heritage buildings has been a problem across the city. She says that for years Heritage Ottawa has been campaigning for the city to do something about what she calls “demolition by neglect” with respect to heritage buildings. “Vandalism, or inappropriate actions or trespass are a problem in rural areas because properties are isolated, and behind a stand of trees, people can get in, and you just don’t know what’s going on. It’s very hard to invigilate a property that is unoccupied,” said Maitland. 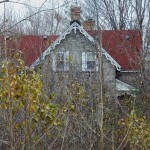 The property is not officially designated as a heritage building, but it is listed on the City of Ottawa’s heritage register, a sort of “watch list” for significant buildings. If a building is on the heritage register, the owner can make alterations and faces a longer-than-usual 60-day waiting period to get a demolition permit, Full heritage designation provides much stronger protection. 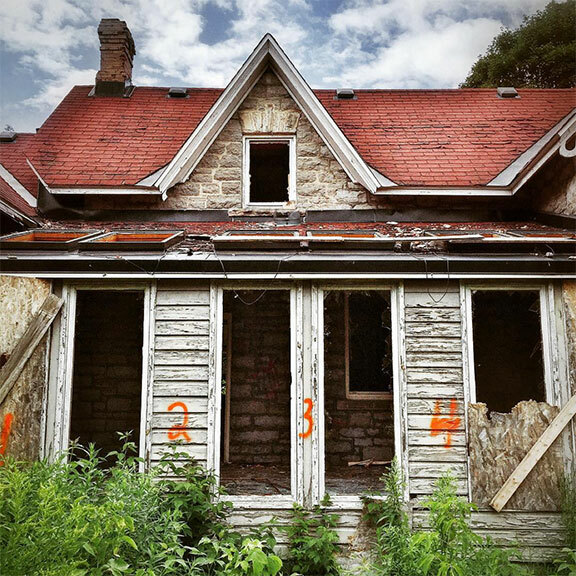 That by-law gives the city the power to move in and do repairs themselves if they feel a building is being neglected, and then send a bill to the owner. This property hasn’t reached that point yet. As for how the house might get incorporated into the overall development: “We have sought zoning commensurate and with the overall proposed development. We will, at the right time, conduct market research to ascertain the needs and determine the appropriate usage,” he wrote. Oh no, that’s too bad, it is such a lovely house. How about installing a bunch of battery operated HD dashcams, hidden… That should help nail those culprits! The Mobius (about $100) has excellent sharpness, but there are cheaper options as well. You might need to invent a battery supply, but that’s solvable. It’s very sad to see such lovely homes being destroyed. Surely the best way of keeping vandals out would be to keep them occupied until such time as owners (aka developers) are ready to do something useful with them. I’m sure there are people around who would happily play a caretaker role by living in these places. I’m also sure that having such a house as this mixed in with a new development would be a strong selling point to potential buyers. First of all, the City should never have been allowed that property to be rezoned. It should only have been purchased by someone who wanted a rural residence, or farm. Why is the owner allowed to let it deteriorate. My guess is he is allowing it to get vandalized to a point where there is no choice but to tear it down, a common scheme among developers. If he is really going to do something, what is the hold-up? Doing nothing, is allowing the vandalism to continue, and in my mind is just as guilty as vandalizing it. I do not want the city to allow anymore of our heritage properties (designated or not) to be rezoned. If its zoned agicultural, the owners can sell to anyone who wants to farm it. If its zoned rural residential, then the owner can sell it to someone who wants to live there. No more sales to developers who pay the price to have the land rezoned. STOP!